SCVHistory.com | Tataviam Culture | Marriage Certificate: John Amos Ward (I) & Dorothy M. Wilson, 9-18-1939. Marriage license and certificate of John Amos Ward (I), 21, of Newhall, and Dorothy Marie Wilson, 16, of Castaic. Married in Los Angeles, September 18, 1939. John was a son of Margaret Sylvia Rivera (Garcia), who was a daughter of Petra Garcia, whose ancestry on her mother's side traces to individuals who lived in the Santa Clarita Valley prior to European contact in 1769. The marriage was performed by a Methodist Episcopal minister, E.A. Stickelman of 205 N. Broadway (Los Angeles), and witnessed by Frank A. Copeland of Castaic. The license states that written consent has been given and filed on behalf of Dorothy. 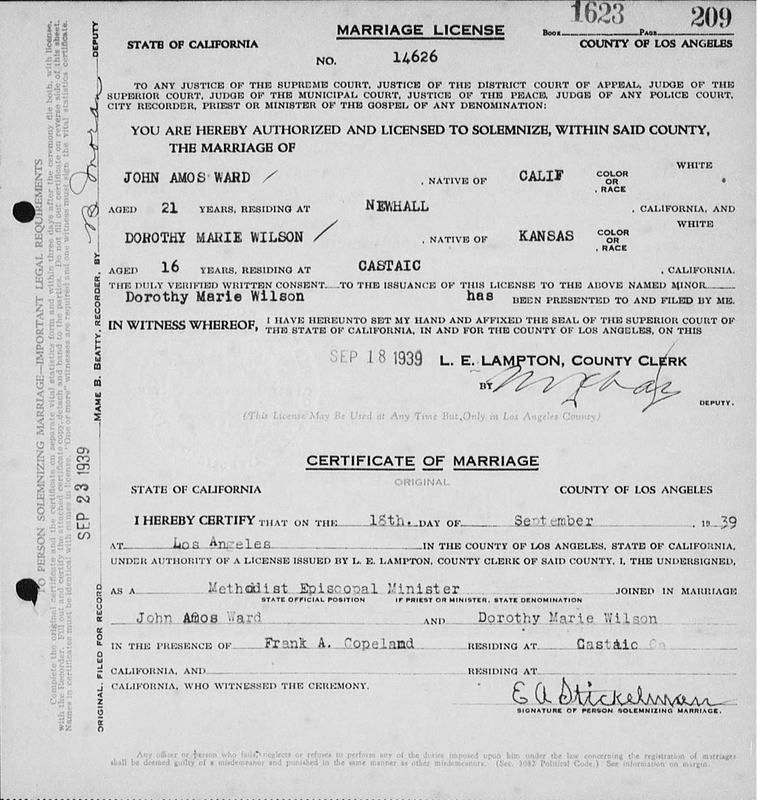 The certificate identifies both John and Dorothy as "white" and says it is their first marriage. It says John was born June 22, 1918, at Fillmore, and lists his occupation as truck driver. It identifies his parents as Eldridge Amos Ward, born in Pittsburgh, Penn., and Margaret Rivera, born in Castaic. It says Dorothy was born February 27, 1923, in Leavenworth, Kans. It identifies her parents as Edward Calvin Wilson, born in Leavenworth, and Geneviare Clara Wilson, born in Lake City, Iowa. John's address is given as 412 Pine Street. This is noteworthy. This is a home of the Erolinda Rivera Cesena family. Erolinda's husband, Leonardo Cesena, died from pneumonia on Jan. 30, 1928 (death certificate on file). A month and a half later, on March 12-13, 1928, one of Erolinda's children, 15-year-old Phillip Cesena, was killed in the St. Francis Dam disaster. The floodwaters carried his body clear to Santa Paula. Erolinda filed a death claim with the city of Los Angeles and was awarded the amount she sought, $3,150, with which she built the 856-square-foot home at 412 Pine Street in 1929. Various Cesena family members continued to live in the house (which was renumbered 24148 Pine Street in the mid-1950s) until the beginning of the 21st Century. Squatters were living in the house when, on Nov. 2, 2014, a candle tipped over and the structure was gutted by fire. We don't know the exact relationship between Erolinda Rivera Cesena and Sylvia Rivera (or Sylvia's father, Pete Rivera, who also died in the dam disaster) that would have caused John Ward to be living in the house in 1939. TLP3901a: 9600 dpi jpeg courtesy of Tricia Lemon Putnam.